Lacquer Lockdown: Hot Off Stamping The Press: Petla Plate Summer 2015 Nail Art Stamping Plate Collection! Hot Off Stamping The Press: Petla Plate Summer 2015 Nail Art Stamping Plate Collection! More new plates! It feels like every time I think I've caught up all my posts I find out I missed a bunch of new plates that either hit the market or are about to hit the market and I am scrambling to get out all the news as soon as possible. One reason I do this is so that you can make informed decisions as a consumer. After all we definitely can't afford ALL the plates we want at least I certainly can't. I'd be living in a house made of plates if that were the case! 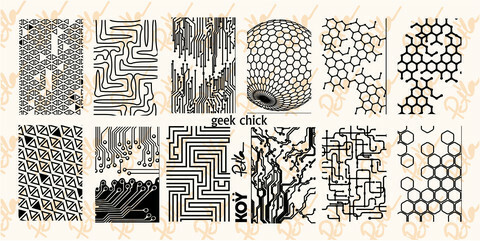 So for today I bring you another set of plates from one of my favorite indie brands - Pet'la Plate. These plates will be from her up coming Summer 2015 Collection so let's take a look. When I first looked at plate I felt kinda borderline about it. 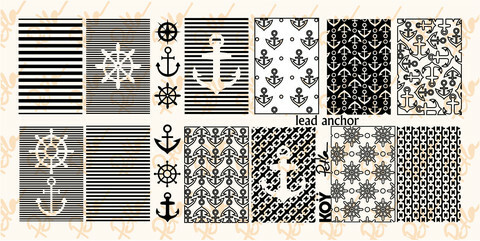 I mean quite honestly there have been a ton of nautical plates on the market so I felt like hmmm another nautical plate. However the images on this plate are pretty unique when it comes down to the wheels and the anchors. Its like Petra took a look at what was out there and thought really hard about how she wanted to shape her own version and it came out horribly unique and utterly want worthy! Like the nautical theme the Geek theme is getting a ton of hard court presses these days. Personally speaking I'm getting a tiny bit fatigued seeing all the computer chips and wires and such. It has nothing to do with Pet'la frankly I love this company and want to own all the plates it's just the theme is getting overused. If you don't already have a geek plate this one is plenty gorgeous especially that sphere shaped honeycomb but if you do this may be one that you put on the wishlist for a rainy day. 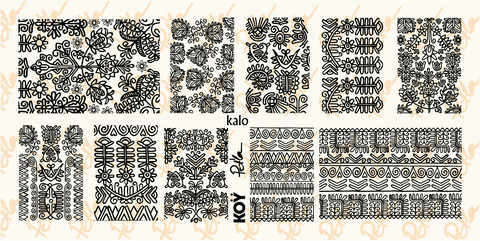 Kalo short for Kalosca which is a Hungarian town famous for its embroidery and obviously the inspiration for this plate. These are traditional folk art themes from Petra's home country. 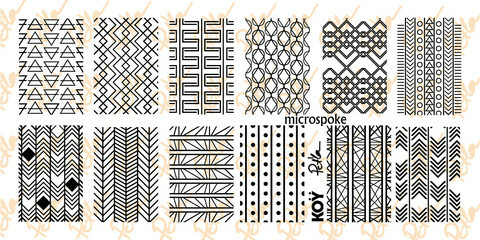 I like that touch of authenticity and frankly I think these patterns are very delicate and soft so I'd love to see them come to life in stamping. 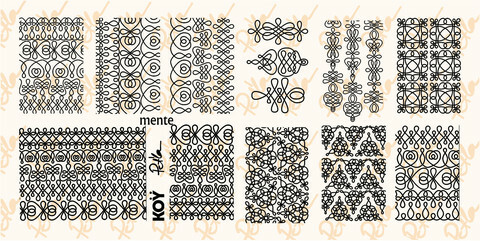 Mente is a soutache and a soutache is some kind of narrow decorative braid used in embroidery to conceal seams <--- got this all from Petra's site since I am no expert on Hungarian culture in the slightest. This is where things start going way over my pay grade. I don't know its some kind of embroidery used to conceal seams. Its Hungarian and another example of touching delicacy in their cultural traditions. That's what I got out of this that and that I want the plate lol. Microspoke something about a different universe under a microscope. This confused me slightly as I have no idea what she must be looking at under a microscope. I spent summers in a lab counting larvae and nucleated cells. I guess I was expecting something else. I'm glad this plate has no larvae because under a microscope they look repellant. This plate feels very basic to me. I like the triangular shapes the most here thinking about ways I could manipulate my bases or colors to give me some fantastic nail art. That's why I like basic plates because the use is endless. This plate is probably the most outright gorgeous plate of the entire summer collection! You can't look away because its beautiful. 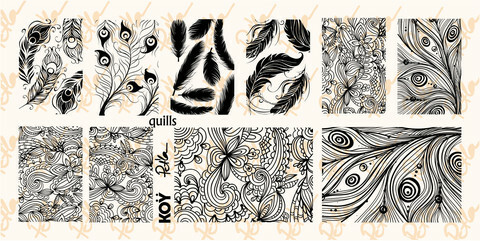 As a paper crafter I'm loving these images in the lower left hand side of the plate. Quilling is really tough but when you get the hang of it its also really beautiful. I love all the feathers too! This plate is everything! 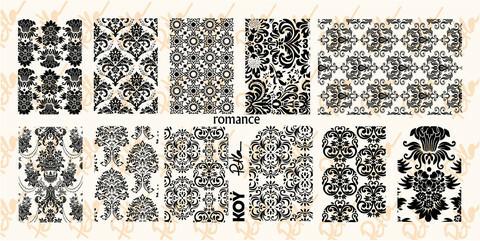 Romance - hmmm damask, illicit affairs, and forbidden glances across the ballroom? Lolol my romance always comes with a slice of intrigue. This plate is so pretty however I will say I have similar plates at least from Loja BBF and Marianne Nails off the top of my head. I'm missing one more brand maybe Messy Mansion leadlight there is a damask plate there that is brilliant! If you don't have any of those or you are just a fan of more pretty, i.e. me, this might be right up you alley for let's say a hidden assignation? 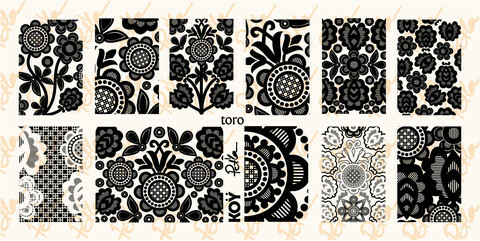 And lace - toro style. This lace is very bold and different from lace images I've seen to date. Because it's so bold it lacks the same soft feel of most other lace patterns and as such these designs will stand out - strongly. I like that since I have an idea for exactly how I'd like to use such a strong lace pattern to create something bold yet utterly feminine. Bring on the lace! So thoughts, lusts, wishlistables? There are several that I must absolutely have to have because A) I want all the plates B) Pet'la Plate is one of my favorite indies C) I'm tired of being bored and this is a company that has yet to bore me. So there's all that. Now these plates retail for 8 Euros per plate plush shipping. They are available for preorder now but will ship out officially on the 15th of July. You can find those and more on the Pet'la website. If you aren't familiar with this company check out my last review of their plates. Happy hunting and I'll see you next post! I think I've just found some more plates to add to my wish list. Especially the one with all the feathers!